Sew Adorkable: Blog Tour Kickoff! We are so excited to kick off the Sew Adorkable blog tour! The book is all about celebrating quirkiness with handmade, unique, tongue-in-cheek projects. What we love most about this book? There are no cookie cutter projects and there is something for everyone, from a candy dots quilt to a geek-chic pencil skirt. 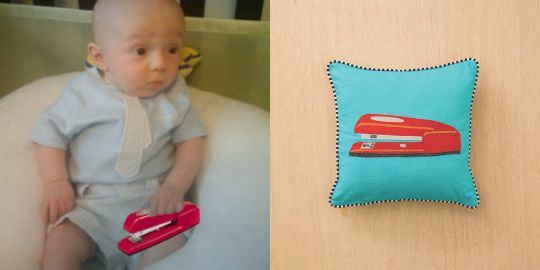 C&T: What inspired you to create Sew Adorkable? Samarra Khaja: Oh, probably the same thing that inspires me to put on pants on any given day; it just seems like a really good idea that people would appreciate. C&T: What was the most fun part of putting your book together? SK: Not only did I make the projects seen in the photos, but I got to write about them in a fun way, and the icing on the cake was adding my illustrations on top of them. Who doesn’t like drawing all over photos? I’m looking at you, my fellow in-flight magazine doodlers. High five! C&T: What surprised you about the book/publishing process? SK: That if you are lucky enough to find just the right collaborators, the entire process can feel just as much fun as it does work. Okay, let’s group hug now! I love working with Samarra! She is so professional but also really funny and always positive. Sew Adorable is so fuuuuuuuun! Samarra's witty sense of humor and amazing artistic talents shine in this book. We get to see her fabric, projects and illustrations all in one book along with her fun writing style. I love the mix of clever illustrations with beautiful photographs of her projects. I love the way she words things in such an approachable way. Instead of construction she says, "Go time"; instead of putting your pieces together she says, "All together now"
Thanks Samarra, I am so inspired by you as an artist! True Story: How the book got its name! I met Samarra at International Quilt Market (I believe it was Fall 2013). Timeless Treasures fireball Hayden introduced the C&T Acquisitions Editor Roxane and me to Samarra, who is one of Timeless's fabulous designers. Hayden thought Samarra would write a great book. The four of us sat down and reviewed Sarmarra’s designs, both for her book and some of her recent fabric lines. If you haven’t checked out her fabric designs, you need to. They’re darling! It was somewhere in between the flying pig fabric and the sketch of the pencil skirt with pencils on it that I made the obvious connection between Samarra’s somewhat silly and overwhelmingly endearing sense of being and that of Zooey Deschanel’s in the "New Girl” TV series. Zooey’s character Jess is quintessentially adorkable. I loved the New Girl’s Jess and I loved Samarra! Adorkable Home became the working title for the book. Rarely does a working title become a final title but this one was close! The world needs more adorkable and we’re lucky to have talented designers like Samarra to provide it! Working with Samarra on her proposal was some of the best fun I’ve had. Each step of the proposal process from her initial pitch (which was hilarious) to vetting the project selection gave me plenty of reasons to smile. I love that the projects themselves are each fun, witty, and in the best of cases give subtle nods to favorite pop culture references. So many of Samarra’s projects remind me of significant points in my own history. The Red Stapler Pillow prods me to recall a certain movie that came out when I was first settling into a professional job. The Typewriter Tissue Box Cover is exactly like the typewriter that I learned on as a freshman in high school and the 8-Bit Birds quilt screams Atari - well, it does to me. As an added bonus, Samarra is just plain fun to work with. Her humor comes out in her illustrations throughout the book but really, there is no challenge I could throw at her that she doesn’t meet with humor. The best example is when another author jokingly mentioned that the only boy fabric she’d not had to sew with was walruses playing football. Well, now there is fabric with walruses playing football, and it’s funny enough that you’d actually want to use it. So, Samarra, thanks for making this such a fun project! I think back to one of my first communications with Samarra. "Can’t wait to see it evolve. There is a reason they assigned me this book. It is right up my alley. Here is a photo of my son from many years ago." Congratulations to Mary K., winner of the giveaway! We hope you enjoy making all of Samarra's dorky and adorable projects, and thank you so much to everyone else who entered! Follow along below for the rest of the blog tour.